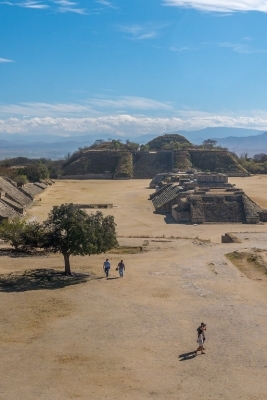 The Historic Centre of Oaxaca and Archaeological Site of Monte Albán are a 16th century colonial town and a nearby pre-Columbian ceremonial centre. Oaxaca is a typical Spanish colonial town: with a zocalo (central square), a cathedral and a strict building pattern. It was founded in 1529 and flourished mainly in the 18th century. Nine kilometers west of Oaxaca lies the old Zapotec site of Monte Alban, dating from BC. Most of what remains now was made from 300-900, during the time about 25.000 people lived here. Tombs, a field for ballgames and several buildings are still in good shape. Oaxaca and surroundings are a must for a trip to Mexico. The town is touristy, but in a nice way. I have to say: it looks a lot like Spain. But Spain also is a nice country, not? After living in Oaxaca's city center for six months, I can without a doubt recommend the food, culture, and history of this region to any traveler heading to the region. Oaxaca itself has a long history, but is once again reinventing itself as the center of Mexico's most exciting culinary foodie scene. It was already considered the birthplace of some of Mexico's most iconic dishes (seven different types of mole being among them), and now this Spanish colonial town has fascinating fusion dishes, alongside a mezcal tourism industry that makes it a hit with those who not only love history, but food tourism as well. Outside of the tightly packed downtown, where I loved the sheer number of boutiques and restaurants, is Monte Alban. It's incredibly convenient to the city (a mere 20 minutes by bus that leaves near the Zocolo), and offers sweeping views of the region. As a site of ruins, Monte Alban is nice, but not my favorite Mexican ruins. I have extensively traveled Mexico, from the Yucatan to the Baja Peninsula, and I've seen many ruins. These ones are not quite as impressive as others, but they are the finest example of Zapotec ruins. From the Maya ruins of the Yucatan to the Aztec ruins near Mexico City, Monte Alban represents a very different culture and history, and that alone (plus the views) makes it worth a visit. The museum on site was a pass for me, but if you are very into ancient civilizations, then it does passing good job at presenting recovered ceramics and relics from the Zapotecs, Olmecs, and Mixtecs that have inhabited the region for centuries. Oaxaca mermerize me because of its great churches. The catedral, with the tipical sismic key, the square facade and its baroche ornamentation. The Santo Domingo church is an amazing building because of its size and exquisite decoration. It does not have a great "chapel of the holly rosary" as many Dominican's churches. and of course the culture made the town a great experience. What surprise me, was how close is from Monte Alban, wich is another Unesco site. The Valley of Oaxaca is full of fantastic sites. The open roof church and convent (Dominicans) and Mitla, another Zapotecas site, plus the cementeries made the area an Unesco destination. The linkage of the apparently disparate sites of Oaxaca and Monte Alban in a single inscription is unusual. Each place certainly has its merits compared with others on the List; Oaxaca is as good as many other colonial towns and Monte Alban as good as many other pre-Hispanic sites. Neither is perhaps is the very “best of the best” but each should surely have been able to “hold its own” in a single inscription, given the ICOMOS/ UNESCO record for interpreting “Universal Value”? So what is the significance of Mexico linking the 2 sites in this way? 1987 was, by the way, a “great year” for Mexico in that it got 6 sites inscribed (this can’t happen again now that yearly nomination limits have been imposed). Interestingly it also proposed another linked “colonial/pre-Hispanic site” – Puebla and Cholula but, on this occasion, Cholula was rejected as not being “significant” enough in its own right. One possibility for the dual nomination was as a device to get more sites inscribed! But I think it is more than this. Every country’s Inscribed (and Tentative) List says quite a lot about how it sees itself and wants to present itself to the outside world (Think Netherlands and its “fight against the waters”, think UK and its industrial/trading history etc). Mexico is proud of its “fusion culture” and a number of its WHS emphasise this aspect. Queretario’s (see my review) nomination documentation describes it as “an exceptional example of a Spanish town whose layout symbolizes its multi ethnic population” and as “foreshadowing the bicultural Mexico of today and the emergence of an ideal form of coexistence in the new world”! In the shorter Nominations of earlier years that of Oaxaca/Monte Alban isn’t quite so “up front” but contains the phrase “This nomination is deliberately diachronic, playing on the historical complementarity of these properties”. But Monte Alban is totally pre-Hispanic. It doesn’t even have the “church built on a pyramid” of Cholula and many other sites across Mexico. 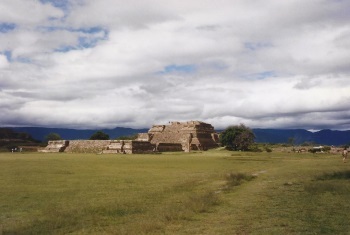 The site was a major ceremonial center for the Zapotecs (mainly 9th/10th centuries) and Mixtecs (11th century onwards). 9kms down the hill (and still separated by some open countryside) is Oaxaca. The valley in which it stands was full of Zapotec villages at the time of the Conquest but, although the city was built on the site of a small outreach Aztec garrison (the Aztecs never conquered the Zapotecs) it is, in design and physical content, totally Spanish (unlike Queretaro which claims a partial pre-Hispanic layout). It is however significantly Zapotec etc in population and culture and it is THAT linkage which the Mexican government has tried to emphasise by this dual inscription. Whether it is justified/works is another matter. We found it interesting to note that the expanatory signs inside Monte Alban were in 3 languages – Spanish, English and Nahuatl. We did however ask a few (non local?) Mexicans what language the latter was and received the guesses “Frances” and “Alaman”! It would appear that Mexicans as a whole are not too knowledgeable about their own indigenous peoples and languages! 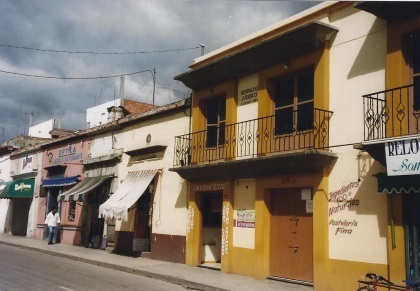 When we visited in Mar 2008, Oaxaca seemed, on the surface, to have put behind it the bloody riots of late 2006; the town was full of tourists around the lively Zocalo and the restaurants were busy. However, those events are relevant to the dual inscription. Starting with protests by teachers, they tapped into deep seated discontents which had and still have a significant indigenous dimension. The “Popular Assembly of Oaxaca” which emerged as the umbrella group coordinating the protests claims to look to indigenous political practices for its inspiration. To understand Oaxaca and the surrounding countryside you need to understand the indigenous peoples, their history and their sense of being wronged- in the past and today. High above Oaxaca, Monte Alban stands as a symbol of their greatest period! But the truly “Bicultural Mexico of today” and the “Ideal form of coexistance” do not yet seem to have arrived. And, if you do visit both? Well, despite its traffic, Oaxaca is a pleasant city to explore and to relax in, though perhaps its general colonial atmosphere is of greater worth than that of individual buildings. 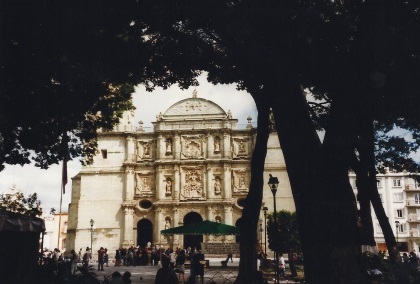 The fine 16th century Convent Church of Santo Domingo (photo 1) is the location of the UNESCO sign. The convent garden has been turned into a botanical garden of indigenous plants but, annoyingly, can only be visited as part of a group tour. The Santa Catalena Monastery has been very attractively turned into another Camino Real hotel – it is worth a wander even if you don’t stay there! Monte Alban will cost you 48 pesos and will take 2-3 hours to visit once you are there. The famous “Dancer” carvings have been removed to the museum (which, in common with all those we saw beyond The National Museum of Anthropology, offers no information for non Spanish speakers) and replaced on site with replicas. There are fine views both of the site and the surrounding countryside from the high points around the Great Plaza (photo 2). To the uninitiated, the views of pyramids and ball courts etc won’t differ greatly from those you may have seen or will see at other sites such a Xochicalco – but it still worth a visit if you are in Oaxaca. 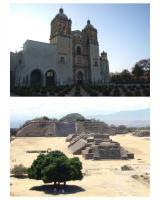 I went to visit Oaxaca when i was 16yrs old. My grandmother was born and raised in a small town in Oaxaca, and she is Zapotec. As a matter of fact, Spanish was her second language. We walked through downtown and went to a night festival in one of the squares in front of a church. It was so great. Then when we went to Monte Alban, i just could not believe where i was standing. It was breath taking. To think that people from centuries ago could create something so wonderful, and so strong that it would last until now!i can say that i stood on history. It was almost scary to think of the things that went on when it was habituated by the Mayans. I definetly recommend going to experience it for yourself. Passage of the Sun: What appears to be a "Zenith Tube" is built into the base of Building P at Monte Alban. "The sun is visible through this perpendicular shaft for several weeks around the time of the zenith passage"
Strikes: 2006 Teachers Strike. Commenced in May 2006 with an occupation of the Zocalo. Attempts to break up the protest led to escalation in June with the creation of APPO (Asamblea Popular de los Pueblos de Oaxaca) made up of representatives of Oaxaca?s state regions and municipalities, unions, non-governmental organizations, social organizations, and cooperatives, the largest group being Section 22, the Oaxacan teachers' union. It encouraged all Oaxacans to organize popular assemblies at every level, declared itself the de facto governing authority of Oaxaca, took over TV/Radio and begun implementing its own laws. The Movement contained significant indigenous aspects including the implementation of 'usos y costumbres' (traditional usages and customs). The action continued throughout 2006 with at least 17 deaths. Aztec Empire: "A short time before the arrival of the conquistadores, the Aztecs took control of the valley and founded the stronghold of Huaxyacac." Part of Cultural nomination rejected: Was originally nominated to include a 3rd element - the (unfinished) Convent of Cuilapan 10 kms south of Oaxaca. In its evaluation ICOMOS stated "(Oaxaca/Monte Ablan), situated within close proximity of one to the other, are historically complementary. On the other hand, it would appear unnecessarily redundant to include Cuilapan, which is located at some distance from the others, in a nomination to the World Heritage List. ".